Custom designed for your precious Samsung Gear S3 Classic / Gear S3 Frontier / Moto 360 2nd Gen 46mm Smart Watches and any 22mm Wide Watches. High Quality Stainless Steel: Made of premium stainless steel metal loop; ventilate, breathable and comfortable to wear. 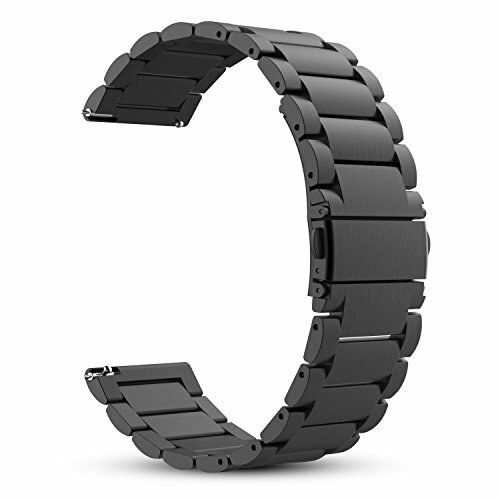 Adjustable Strap: The size can be adjusted according to the circumstance of individual wrist. Fits 6.69"-9.25" (170mm-235mm) wrist. Durable and Sturdy: Band comes with durable metal lugs on both ends, which locks onto your watch interface precisely and securely. Top quality stainless Steel with stylish superior craftsmanship. Unique Folding Clasp: Adopt unique double button folding clasp, firmly closed, and prevent loosen automatically, safe and beautiful. Custom designed for your Gear S3 Frontier / S3 Classic / Moto 360 2nd Gen 46mm Smart Watch and any 22mm Wide Watches with this Stainless Steel Strap. The size can be adjusted according to the circumstance of individual wrist, fits 6.69"-9.25" (170mm-235mm) wrist. Top quality stainless steel material and High-tech surface finish, suitable for both business and casual occasions. Refined dual fold-over clasp design, easily to take on/remove, firmly closed and prevent loosen automatically, safe and fashion. Up to 8 links can be removed, user can adjust the length easily using the provided link removal tool (Note: Please read the instructions in the package).